Deep irony is palpable in most of the 42 poems in Prolas Sindhuliya’s “Chupchap ko Antya,” meaning “The End of Silence. Sindhuliya touches upon many topics from birth, death and human duty to the festering insurgency in this anthology. Written in Nepali, Sindhuliya’s poems are the result of his experience of life and world than that of imagination. Anthology under review covers at length the vicissitudes that the Nepali society is witnessing. Like American poet e. e. cummings, the unique features of this anthology is the poet’s rhetorical experimentation – experimentation in syntax, semantics, morphemes and stanzas. Sometimes, he fragments the stanzas intentionally and creates an effect in the reader’s mind. His anthology is divided into four parts. The first part begins with the poet’s desire for living and the fourth part ends at the royal palace. A beautiful blend of humor and mild satire has made his poems worthy of enjoyment and emotion. 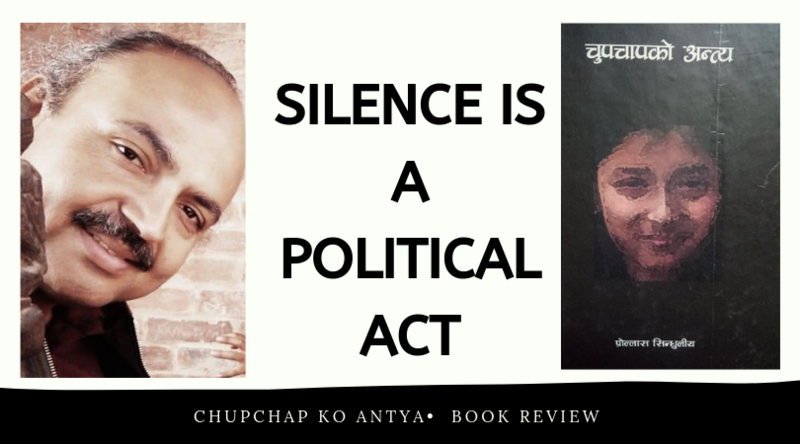 “Chupchap ko Antya” highlights the power of silence. Silence, for the poet, does not mean the acceptance of agony and tyranny, rather, it is another means of revolution. There is an immense power in silence. If one fails to realize its meaning, it may burst into a fireball or may, in black American poet Langston Hughes’ words, “explode” at any time. So the psychological explosion is the end of silence. “Tespachhi chupchap, chupchap rahena Sandaibhari” In “Money collected to publish an anthology of poetry,” the poet laments over the plight of poet and poetry in the context of economic pressures. The poetry speaks through the voice of the common people of villages like Gajindre, Basukaka, Thule, Kanchhi, Khadga Bahadur, etc. The poet is living under the condition of duality between his dreams and reality as well as his imagination and work. The book’s main weakness is that the poet is unable to handle the experimentation and sometime he is vague about his ideas. Sometimes, he begins with powerful expressions and, anticlimactically, equivocates in the next few lines. Themes like gender inequity, unjust relationships between the husband and the wife, equal rights and respect and do’s and don’ts of a so-called conservative society are often the central elements of his writings.